In the wake of the Thomas Fire, many people have expressed concern over the state of the burn areas, particularly in relation to landslides from the bare slopes and how native and invasive plants will respond. Channel Islands Restoration has experienced unprecedented growth in 2017. Due to the energy of our volunteers and staff and the generosity of our donors, we have worked on 25 projects in 2017 so far. We have removed an uncountable number of invasive weeds, propagated tens of thousands of plants and we restored habitat from the Channel Islands to the San Rafael Wilderness and everywhere in between. More than 800 volunteers and around 200 financial donors have made this possible. CIR Work at Pt. Mugu Featured in Navy Magazine! Base personnel from the environmental department onboard Naval Base Ventura County (NBVC) Point Mugu, California with some help from the Channel Islands Restoration (CIR) staff and volunteers are enhancing critical wetlands without competing with the base’s military mission. Right now during the month of December, your donation to Channel Islands Restoration is doubled. An anonymous group of donors have pooled their money and pledged to match every dollar we fundraise with a dollar of their own - up to $6,500. If we don’t raise a matching $6,500, then we’ll only receive a respective percentage of the match. Channel Islands Restoration is currently leading the largest-ever restoration on San Nicolas Island. With the help of volunteers that have put in well over ten thousand hours over the years, we’ve grown and planted more than 30,000 plants to restore critical habitat throughout the island. CIR, with two crews of intrepid volunteers, took two trips down the Sisquoc River deep in the wilderness of the Los Padres National Forest in October and November of 2017. Throughout August CIR staff, UCSB students, and community volunteers got down in the marshes to survey for salt marsh bird's-beak (Chloropyron maritimum subsp. maritimum). On a gorgeous Day in March, over 50 CIR volunteers and donors were treated to a unique trip in a classic dome lounge-dinning train car up the coast to San Luis Obispo and back. Five days riding on the backs of mules left us sore but happy, as we scouted the Sisquoc River and Manzana Creek for Tamarisk trees. With the rain arises a new array of benefits and obstacles. Much like the harsh drought helped eliminate poorly-adapted invasive species, yet made the establishment of new natives difficult, rain offers a gradient of impacts. Channel Islands Restoration proposes to eradicate non-native invasive Tamarisk species in the Sisquoc River and Manzana Creek. The objective of the project is to restore and maintain habitat for riparian dependent species such as the federally listed arroyo toad, California red-legged frog and steelhead trout. To those that would like to get more involved with CIR and work a little "behind the scenes" - we just so happen to be looking for dedicated and creative volunteers to join our Party Planning Commission. In the past year, support from donors has given us the capital to pursue grants for new and exciting projects and to continue work where federal funds have been eliminated. Plus, donations have helped us further our education outreach and bring underprivileged kids into nature and onto the islands, and it hasallowed us to expand our efforts to restore special and important habitat on the Central Coast. To those that have given at other times in the past year: THANK YOU, and please consider sustaining or upgrading your membership through monthly donations. Now through automatic monthly donations, there's no need for reminders or alterations in your monthly budget! However, regardless of how you donate, and regardless of how much, we sincerely appreciate your support. Without donors, we wouldn't be able to continue the mission of CIR. Anacapa Island is more a chain of islets rather than one large island and because of this, it has a high ratio of coastline to interior. This expanse of ocean bluff and coastline provides critical and/or important habitat for seabirds, marine mammals, and a number of rare plants. The island boasts sixteen plant species that are found only on the Channel Islands, two of which are unique to Anacapa, and the largest breeding population of the formerly federally endangered Brown Pelicans (Pelecanus occidentalis) in California. Anacapa Island is an important breeding location for the Scripps’s murrelet (Synthliboramphus scrippsi), one of the world’s rarest seabirds, and the ashy storm-petrel (Oceanodroma homochroa), a California Species of Special Concern. By mid-afternoon on Santa Rosa Island, the winds reached gale force. 50mph gusts tore through our worksite in the cloud forest, throwing grit in our eyes faster than our tear ducts could remove it. Still, we labored to the best of our ability, working to retrofit a series of erosion control barriers beneath the island oaks before the sun set behind San Miguel Island to the west. This March, CIR hosted its annual membership gathering at Goleta Beach Park. This membership gathering was one of our most well attended, with more than 50 members present to enjoy the soft drinks and spirits, the barbequed chicken and veggies, and the good company of other CIR members. We were honored to recognize John Reyes as the Member of the Year for his incredible dedication to volunteering and his help in building our three new plant nurseries this year - located in East Anacapa Island, San Nicholas Island, and Camarillo. In addition to the good company at the park, members were treated to an exclusive natural history tour, with CIR Senior Ecologist Elihu Gevirtz leading a short walking tour of the Goleta Slough and Dr. Tanya Atwater giving a talk about the geology of the local area and the Monterey Shale that it sits atop. Our Member Gatherings are free to all who join CIR at a minimum of $35 in a year, in addition to many other benefits. To learn more about our CIR donor benefits and to become a member or renew an existing one, please visit cirweb.org/donate/ and thank you in advance! In the past few months, CIR volunteers have been hard at work on San Nicolas Island and have installed more than 12,000 plants. After removing patches of invasive ice plant, the volunteers installed and have been maintaining native plants to stabilize sand dunes on San Nicolas Island with resounding success. 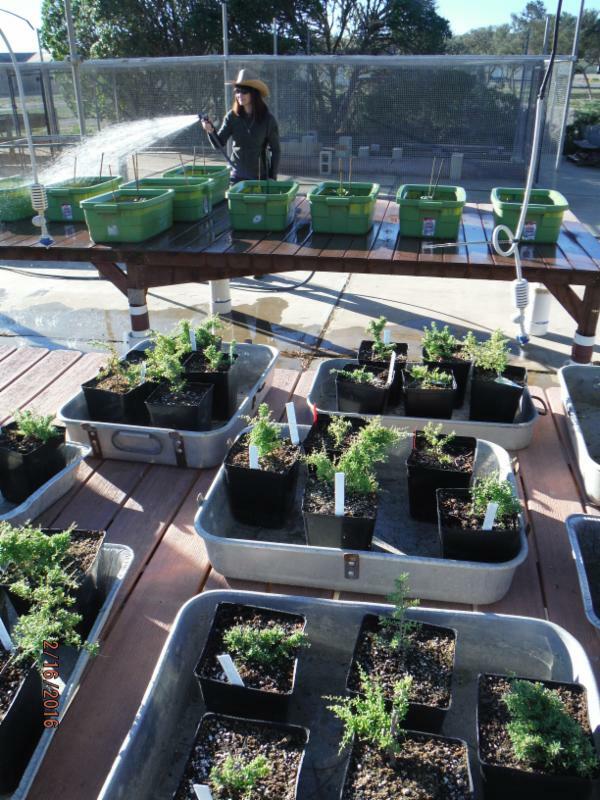 Plants were grown in our San Nicolas Island Nursery built last year. We also have been working to restore upland habitat for the threatened island night lizard and are currently in the process of growing additional plants for this project in our San Nicolas Island plant nursery that we will install in the coming months. We are incredibly proud of the plants that we have been able to produce from the nursery, especially a newly discovered plant, just last year, Lycium brevipes 'desert box thorn'. It was thought that this particular species was long extinct on San Nicolas Island. We were able to collect cuttings last fall from a population on 10 plants. These cuttings were propagated and planted in the landscape around the nursery. The plants were placed on a drip system. This planting has been so successful that we have been able to collect more cuttings from these plants and start an additional 400 new little clones. These new plants will be planted out this coming fall/winter creating more habitat for island critters such as the endemic night lizard. Besides box thorn we are growing cactus, buckwheat, mule fat, morning glory and a whole palate of native bunch grasses. We are very glad we are afforded the opportunity to be part of the habitat restoration for San Nicolas. Recently we have improved the nursery with fantastic flood tables, capable of propagating plants with high water demands - like those near marshes or in riparian habitat - with very little water waste. Each table has its own dedicated waterline and can be manually watered or set on a timer. This is all possible because of great, dedicated volunteers. Trips to San Nicolas Island fill incredibly quickly and spots are coveted. Because of the demanding and high priority nature of our work with the US Navy on San Nicolas Island, CIR mostly seeks volunteers that we have worked with in the past on this or other projects, so that we can work with teams of known quality during our short trips to the island. This year's spring and summer natural history trips were truly exceptional. 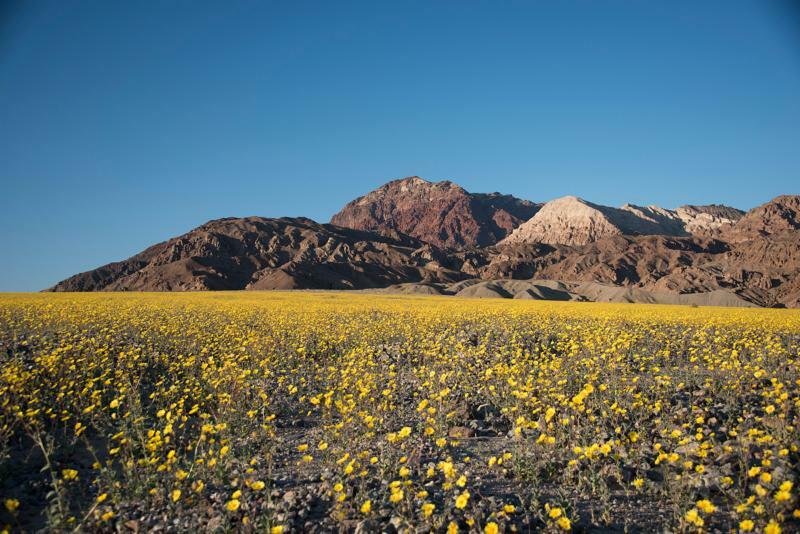 Our Death Valley trip took place right at the height of the super-bloom and the once bare and desolate floor of the valley was carpeted with desert gold and pocketed with dozens of other native desert wildflowers. This past El Niño brought torrential amounts of water to many parts of California that desperately needed it (while also inexplicably missing others) and over the course of the winter Death Valley received a full 2.7 inches of rain. This amount may seem insignificant, but the Valley normally receives no more than 2 inches of rain in an entire year. This small, yet concentrated amount of rain, was enough to germinate millions of dormant desert wildflower seeds that all shot up to form a massive super-bloom - the likes of which the valley has not seen since 2005. While the super bloom was spectacular and novel, it was unable to dwarf Death Valley's usual splendor of barren rocks, braided badlands, and the bed of a long-dead lake - the story of which Dr. Tanya Atwater unfolded over the course of the trip. Meanwhile, Steve Junak told stories of present day life in Death Valley and how the native plants and wildlife are able to carve out a niche in one of the harshest and most desolate regions of the world. A few months later during the hot summer months, we ventured high into the White Mountains to walk in the cool mountain air among the oldest trees in the world. At first glance, the high peaks of the White Mountains reveal little more than ancient trees among the barren rock, but the land came alive through interpretation from Tanya Atwater, Steve Junak, and Santiago Escruceria. Concentrated beauty could be found all around in the low-lying flowers that lay hidden within the rocky crevices which gave shelter to the biting wind. This tiny and hidden beauty lay in contrast to their home atop the massive mountains that were left from the collision of two massive continental plates. Trips to these unique and spectacular locations happen every year, so be on the lookout for our natural history trips to Death Valley and the White Mountains. Both trips sold out every year over the past six years, so act quickly to make sure you don't miss out! In addition to these, this year we will be hosting two more natural history trips this spring: one along the Central Coast and another on a luxurious train ride between Santa Barbara and SLO. The Central Coast trip will focus on the area surrounding the San Andreas Fault. It will form a loop that begins at Morro Bay, and from there we'll travel north to the volcanic formations at Pinnacles National Park, then west to Hollister, south through the coast of Big Sur, and we will end with a tour of the Piedras Blancas lighthouse. And finally, we'd like to welcome all aboard on an amazing excursion led by the extraordinary geologist Tanya Atwater, and Steve Junak, botanist, storyteller, and CIR Board Member. This exciting trip will offer rare glimpses of some of the last original native coastal landscapes in Southern California. Beginning at the Santa Barbara train depot, you will ride in style aboard a beautifully restored Vista Dome Lounge-Dining Car built in 1956. You will be treated to a narrated scenic journey along a spectacular part of the coast, and through several ranchos that cannot be seen from Highway 101. We will travel through Gaviota, the Hollister Ranch, the Cojo Ranch (including Point Conception), Vandenberg Air Force Base (including the Sudden Ranch), and the Guadalupe / Oceano Dunes region. Learn about the area's rich human and natural history before stopping in San Luis Obispo. Enjoy a catered buffet lunch on board, including beer, wine and soft drinks. Passengers are free to change levels and sides in the car for a new and different view on the way back. This is a fantastic opportunity to see parts of the coast by rail that are otherwise inaccessible.